wow. they listened to feedback. that’s great. I really hope they pull the trigger on this and don’t blink. It shows that the Cascades train in the Pacific Northwest (Vancouver BC – Seattle – Portland – Eugene OR) does roll-on bicycles at 10 per train for $5. The Chicago – Pittsburgh – DC train will apparently be 7 per train for $20. I’m less concerned with the charge and more concerned about the service existing in the first place. For most other services, states paid for the bike accommodations — either through new equipment, or by requiring it as a condition of ongoing operating subsidy. That’s not the case here, where Amtrak paid to install the equipment. $20 is cheaper than the old bike + box charge, and it’s a bargain for carriage from Chicago to DC. Yes, on a percentage basis it’s a bit silly for Pgh-Connellsville — but consider that by far the highest demand for the racks is on the GAP/C&O segment, so demand needs to be managed there. SUCCESS!! After five years on this thread, over six since I first pursued the idea myself, a member of the general public has boarded an Amtrak train in Pittsburgh, with a bike, and did not have to take it apart first. We have also independently confirmed that the bike reservation system is live on the Amtrak website. Thanks, Stu, for all the work you put in to this. Awesome! Thanks, Stu! I just checked it myself and it works! Next up, the Pennsylvanian! Stu, you’re awesome man! Thanks for everything you did to help make this a reality!! We missed using this service by a couple weeks this year, But our next annual Pitt/DC ride will be a lot more enjoyable because of this!! So, if the roll on service is fully booked, can you still box your bike? I suppose you can, though I don’t know why you’d want to. > I suppose you can, though I don’t know why you’d want to. because you still want to take your bike, even though the roll on service is fully booked? there are 7 spaces per train for regular sized bikes and 1 space per train with two tie-down straps to eventually accommodate a recumbent bike. The recumbent space is “coming soon” due to some additional development work needed in order to reserve and sell the space within Amtrak’s reservation system. As soon as that space is available to reserve I will let (people) know. @Vannevar: is “recumbent” Amtrak-shorthand for “odd-shaped bikes”? Tandems, for example? I also wonder about trailers, trail-a-bikes, and similar contraptions. Regardless, this is a huge step forward…I’m jazzed. I sense the opportunity for some kind of Clue/Murder on the Orient Express type mystery game involving a train ride out to about Connellsville and clues stashed along landmarks on the ride back. Must think on this. Dan, I just had a similar convo with Beth. Suppose you reserved and paid for the recumbent spot, but showed up with your tandem (or other non-standard bike). Maybe your recumbent broke last night. Maybe the phone center staff told you, sure your tandem is OK just reserve the floor space. Maybe you arrive with doughnuts. It’s always tricky to make distinctions by device category. As in: phones are cameras are calendars are flashlights are maps are computers. Are e-bikes permitted on Amtrak? hmm… You’d have to be a Talmudic scholar (as our friends Ben, Yale, and others certainly are) to parse the code. I’m taking notes. The committee’s work is not yet done. This is good input. I’m thinking Amtrak needs to have a FAQ page for bike transport. Questions, answers, diagrams, links to video how-tos, the works. What-all should I ask or suggest? Ask for a list of which stations have practice racks (just like the ones in the rail cars) on which passengers can practice hanging their bikes. As alluded to above, clarification on “weird bikes”…maybe something like permitted length-width-height dimensions as Vannevar suggested, rather than generic categories like”recumbent” or “tandem”. Details on what accessories (panniers, handlebar bags, trailers) can remain attached, versus what must be removed. stations need placards with directions to bike infra/ trail. change terminology from “recumbent” to “rack-incompatible bike” because I think that’s the essence of what they’re trying to accomplish, and provide some max footprint parameters. Let a person reserve a bike and an RIB (rack-incompatible bike) and then they can pay for two slots and bring a trailer. If I knew the service would realistically allow me to bring the bike train, I’d book it in a heartbeat. They could publish what they want, but the most effective way to minimize uncertainty would be to put sample racks in the stations. * Next to the practice rack, can we please have a stocked set of “diaper wipes” (whatever you call them) so we can wipe down our bikes before bringing them on the train. Probably a lot easier to do that than install a hose or leave a loose bucket of water to be kicked over. We took the Amtrak back to Pittsburgh from DC this past weekend and used the roll on service. It was pretty cool and all of the Amtrak employees at Union Station in DC (and on the train itself) were all really cool about. They were all very helpful and it went really well. It just took about 8 hours to get back and it’s only once a day from DC so it gets in at midnight. Thanks for your help getting this set up. 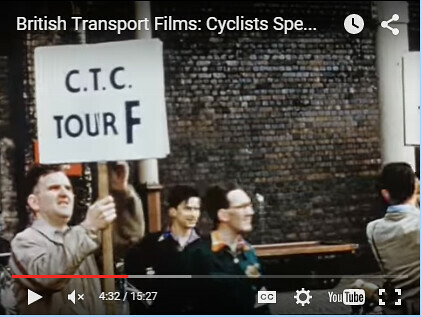 …but the beginning of this 1955 British film has some nifty-neato stuff on RORO and the British railways. The whole film is bloody ace. The derailment on that Amtrak train in Vermont is on the 2nd line that’s supposed to get RORO service. It was supposed to start within a couple of weeks, but that’s going to have to be delayed while Amtrak deals with the larger mess. A friend took his mountain bike on the amtrack with RORO and had some issues with the size of his tires (29×2.4) and the RORO racks. Is there any guidance on what the max tire size that works on these racks is? This is kind of important since a lot of people may want fatter tires for the less improved C&O canal trail surface, and the burgeoning popularity of drop bar mountain bikes. The next conference call is Tuesday. I will be sure to point that out. Thanks. Amtrak’s service updates page mentions two other trains that got bike service recently, a pilot program for the Heartland Flyer (Oklahoma City-Fort Worth) and the Carolinian (North Carolina). 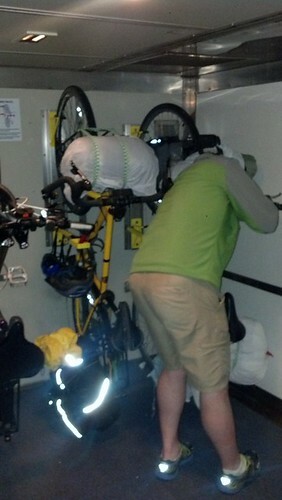 On those you hand your bike up to an Amtrak employee in the baggage car, instead of securing it yourself. The description for the Capitol Limited has this curious text: “If your bike has a large seat/saddle bags, you will need to remove it from the bike before loading it on the train. The seat can either be carried on the train or checked, where permitted.” I wonder if they meant to refer to seat bags, not seats. Anyway, if they want people to remove large bags and/or seats, they should really specify what “large” means. Sticks out more than X inches from the center line? Weighs more than X lbs? And let me add my thanks to the chorus, Stu, for all your work on this. Uwe Eickert sent the GAP email group a couple photos of him using the bike rack. I’ve copied them below. Tried it out on Sunday from Harpers Ferry to DC. Everything was straightforward: the conductors know to expect bicycles and had the door to the bike compartment open as the train pulled into the station. It stopped right in the middle of the platform, although HF has a short platform. 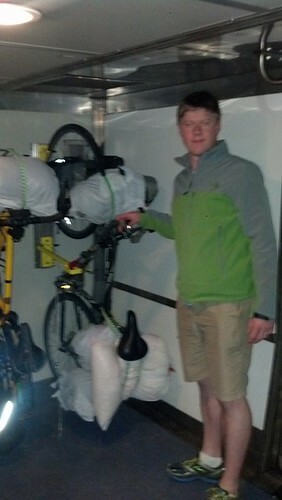 We walked up, the conductor helped us lift the bikes into the car, and we hung the bikes from the rack. The only fiddly bit is the bar in the middle, which swings out so that you can use its Velcro strap to stabilize the down tube. There’s a regular luggage rack by the stairs just outside the bike room. The only thing I’d do differently is to unclip the panniers first. I’d wanted to take the train out on Friday, but the bike racks on that leg were sold out two weeks in advance! They made us take all of our panniers, handlebar bags, etc. off of our bikes before we could put them on the train. We had to check all of our gear in a separate bag (we had packed a big duffle bag with us for this purpose though). Whatever. If anyone tries this on Amtrak, let us know how it goes, please. Metro North said no bikes, so we ran to the hardware store and packed our sculptures in time for the next one. So, i’m curious to know whether you can box a fat bike or 29+ on amtrak between stations with checked baggage service. I’m almost positive these won’t work for roro service due to the size of the hooks in baggage area. I thought it could be nice to ride fat rubber during the spring soggy season. 2. Any other special considerations for disassembly? Has anyone tried this or researched it? I know the question was asked of the higher-ups; I’m the one who asked it in the committee’s last telecon. There should be something on the website by now. If there is and it’s hard to find, that’s a problem. If it’s not there, that’s a problem. If it doesn’t answer the question definitively, that’s a problem. Other than that, the Capitol Ltd service should be running smoothly. We’re looking into next year before the Vermonter is able to do likewise. I’m quite sure that a fat bike would fit into Amtrak’s very generously sized boxes. If you have any doubt, you can probably stop by the Amtrak station and ask to try out a box — just slide the back wheel into the box. Hmm…if one carried an S-hook or similar, sized to fit a fat tire, could you get away with using that to hang the bike from the RORO hook?